“Many of you may have heard — about two years ago a girl got hit by a pickup truck after trying to get off the late bus,” a school bus that had just let off students on the Post Road, Rhea Bhat, a Darien High School freshman recently told the Board of Selectmen. 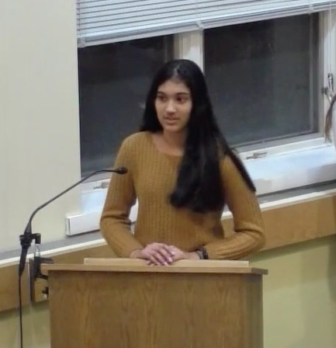 Bhat, a member of Students Against Destructive Decisions at the high school was one of nine high school girls who told the board at its Monday, Nov. 26 meeting what they do at the Depot—Darien Youth Center and how valuable that is to them. Bhat went on to talk about the incident, which was covered in news stories at the time, how she was affected by it since and what she’s doing, partly in SADD meetings at the Depot, to try to prevent others from driving distracted. I’m a freshman this year at the high school. I just joined SADD this year, and I would just like to take a minute of your time to explain how I cam to SADD. I’m actually a victim of distracted driving. Many of you may have heard — about two years ago a girl got hit by a pickup truck after trying to get off the late bus. That girl was me. When I was in seventh grade, I tried to get off the late bus and cross the Post Road to get to my house. My parents have always told me to look both ways before crossing any road, and I was trying to do the same that day. So I looked to my right, and there were no cars there. And I tried to look left, but before I could even try and look left, I just felt a huge, really powerful force push me back, and I fell to the ground. I was in confusion, shock — pain, obviously, and I later realized it was a distracted driver who had missed [seeing] the stopped bus and me. And what’s interesting to me was that the [driver’s] cell phone was not even in his hand. The cell phone was ringing in the passenger seat of the car, and for a split second, he took his eyes off the road to see who was calling him. And that one moment changed my entire life in so many ways, I can’t even explain it. Psychologically, now, whenever I try to cross a road, I have that stress and that fear and I just — I need someone to help me cross the road. A 30-year-old Darien man told police he was texting when he hit a tree as he was driving on Hollow Tree Ridge Road, and police smelled marijuana in his car, then found some, police said. He wasn't injured in the accident, but the 2009 Chevrolet Cobalt he was driving was disabled, police said.